Tulay Atak is an architect and an architectural historian. Her work focuses on questions of modern urbanism in a global context. She received her Bachelor's degree at METU in Ankara, Turkey and pursued her PhD at UCLA. Her dissertation, "Byzantine Modern: Displacements of Modernism in Istanbul," considers the place of Istanbul in the making of modern architecture. 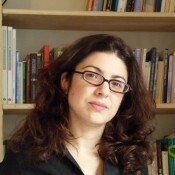 Tulay studied critical theory in Paris for a year at the EHESS. In addition to her dissertation, she pursued research in India and Switzerland. She conducted fieldwork in Chandigarh as part of the Getty Research Institute's project on Museology and the Colony. Recently, she worked as part of a team of scholars archiving the work of the structural engineer Heinz Isler for the ETH in Zurich. Tulay's writing has appeared in journals and edited volumes such as Future Anterior, PMLA, JAE, JSAH, Invention d'une Architecte and Construction Savante. She has curated exhibitions at Cornell and the BSA. She has taught at SCI-Arc, Cornell, RISD and Pratt Institute. View Tulay Atak's full CV here.